In the energy sector, IoT technologies have changed several aspects, such as reducing the possibilities of failures and delays, enhancing productivity and efficiency, improving real-time decision making, solving critical problems, and creating new and innovative experiences. As oil and gas companies are exploring ways to cut down production costs and optimize operations to increase profit margins, solutions provided by IoT technologies to tackle these challenges are witnessing increased demand. IOT solutions aid in minimizing risks and improving safety across all the processes in the energy industry. Oil and gas production output can also be enhanced with the assistance of IOT solutions. IOT solutions can also be used for assessing risky operations, and preventive measures can be undertaken to avoid accidents in the energy industry. In the coming years, with constantly improving technology and increasing integration of large-scale data, even small- and medium-scale players in the energy industry would be drawn to adopt IOT solution and services in the near future. According to this report, the global IoT solutions market for the energy industry will expand at an unprecedented CAGR of 29.5% over the period between 2017 and 2025. The IOT solutions market for the energy industry has been segmented based on solution, application, end-user industry, and region/country. On the basis of solution, the market has been segregated into: analytic software, hardware platform, service, and connectivity. By application, the market has been divided into pipeline, refineries, grid control, digital oilfield, and others. By end-user industry, the market is classified into oil & gas, solar, wind, and others. By end-user industry, oil and gas constituted the dominant share of nearly 72% in 2016. 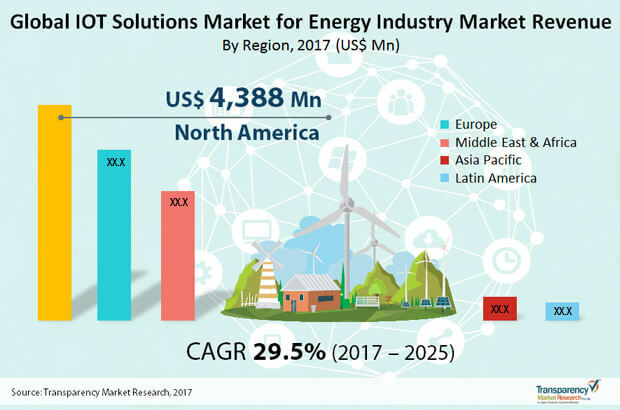 The global market for IOT solutions for energy industry has been segmented on the basis of geography into North America, Europe, Asia Pacific, Middle East and Africa, and Latin America. The global IOT solutions market for energy industry was dominated by North America in 2016. The U.S. is the market leader in region owing to the fact that the oil and gas industry in the country has been utilizing IOT solutions on a wide scale, especially in upstream applications. Europe was the second-largest market globally for IOT solutions for energy industry in 2016. Countries such as France, Germany, and the U.K were the major players in Europe IOT solutions for energy industry market in 2016. Asia Pacific was the third-largest market globally for IOT solutions market for energy industry in 2016. However, Asia Pacific is expected to grow at a higher growth rate when compared to other regions across the globe. Countries such as China, India, and Japan are expected to be the major players in the region during the forecast period. The IOT solutions market for energy industry in Middle East and Africa accounted for a mere 3.2% of the global market share in 2016. Middle East and Africa IoT solutions market for energy industry is expected to grow at a moderate rate. Countries such as as GCC and South Africa are expected to drive the market in the region during the forecast period. Some of the leading companies operating in IOT solutions market for energy industry are AGT International, Carriots, Cisco, Davra Networks, Flutura, IBM, Telit, Maven Systems Pvt. Ltd., SAP SE, Symboticware Inc., Hortonworks Inc, Accenture, and Tego Inc.